Please note that the illustration shows this product in a different language format. You will be sent the BENGALI-ENGLISH version! 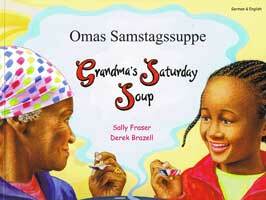 Bright and colourful illustrations accompany this dual-language edition of Grandma's Saturday Soup. Mimi misses her Grandma. Every day something reminds her of Grandma's special Saturday Soup and the tales her Grandma tells. Sally Fraser's delightful description of Jamaica and the wonderful soup, accompanied by Derek Brazell's vivid illustrations, make us all wish that we had a Grandma like this! This book is a high-quality dual-language picture book, suitable both for children who are learning and reading Bengali and English in parallel and those being introduced to Bengali as a second language. The Bengali in this text is fairly simple but it would be helpful for the parent / teacher to have a basic knowledge of the language as no pronunciation guide is included.